I have been thoroughly enjoying my long weekend at home relaxing, playing in the kitchen, and catching up on stuff like harvesting and freezing tons of tangerines from the tree in our backyard for smoothies, growing more sprouts, and minimizing clutter in the office. 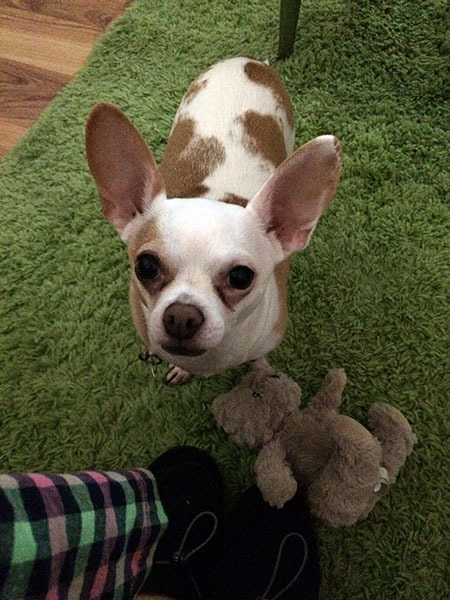 And playing with this sweet little guy of course. 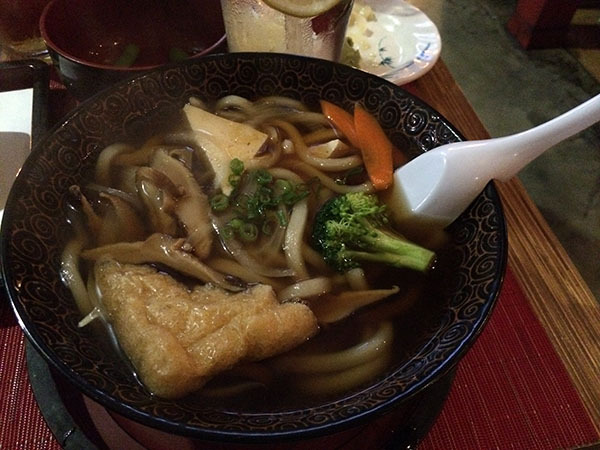 Also enjoying some great vegan dishes dining out like this veggie tofu udon noddle soup from our favorite local sushi place. 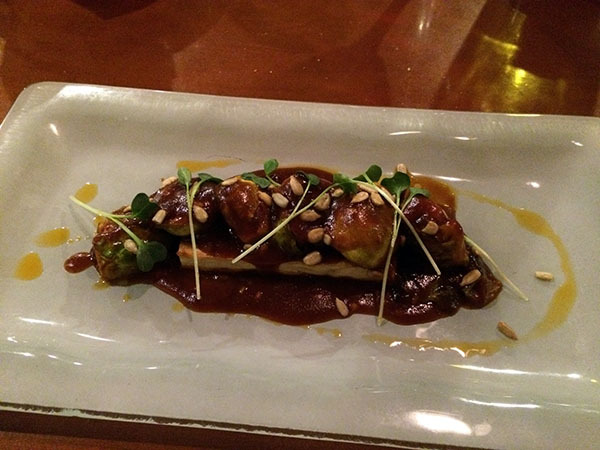 With a side of veggie tempura, this dish is under $10 and too much food for me! But perfect for us since I can share the tempura with hubby. 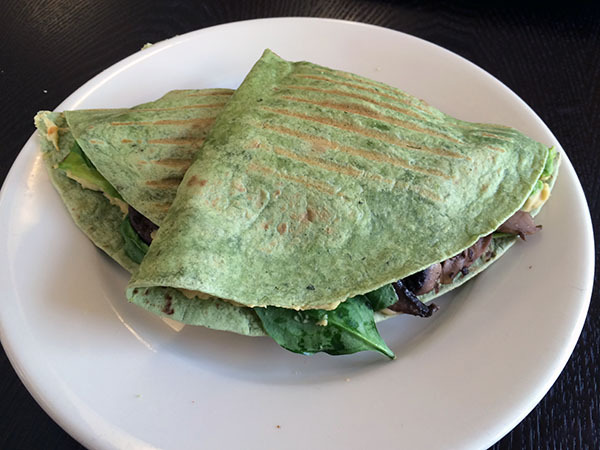 I also had the mushroom spinach quesadilla with jalapeno hummus from Baagan. It was delicious with a little kick! 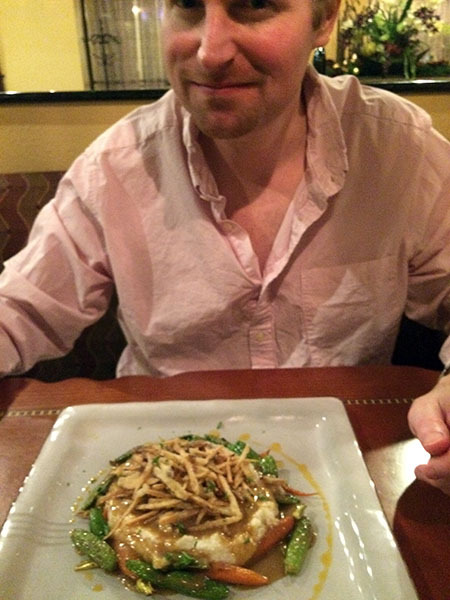 I ordered it because it was a little out of my comfort zone with so many mushrooms, that texture can build up on me. But this was great with the creamy hummus and spinach blended in. 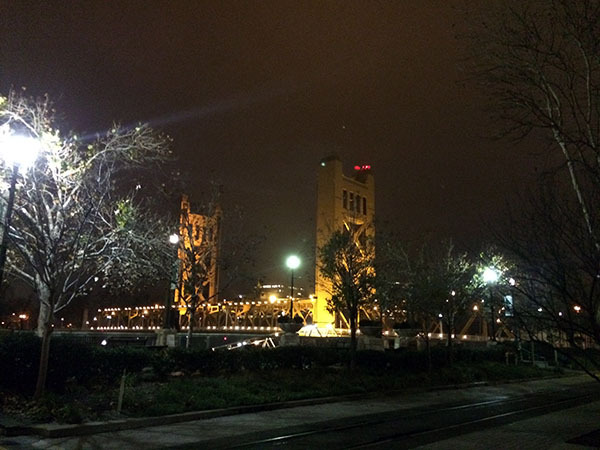 And we headed into Sacramento for a splurge dinner at Tower Bridge Bistro since they’re doing weekend vegan menus through Valentine’s Day and maybe longer, had to support that! 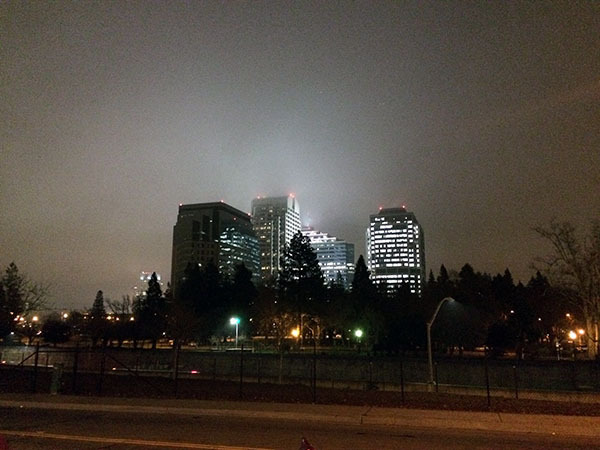 The night view of the city in the fog was gorgeous and eerie. The view of the Tower Bridge was beautiful. 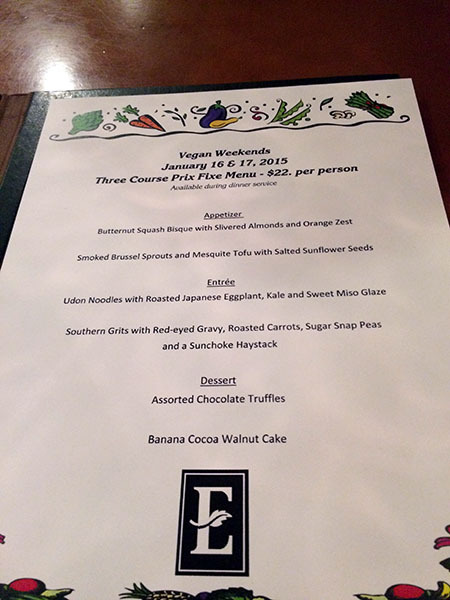 Between hubby and I, we tried everything on the vegan prix fixe menu. 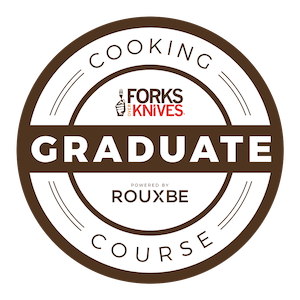 The smoked Brussel sourts with mesquite tofu was fun, the slightly charred Brussels were great with the sweet and tangy BBQ flavor. 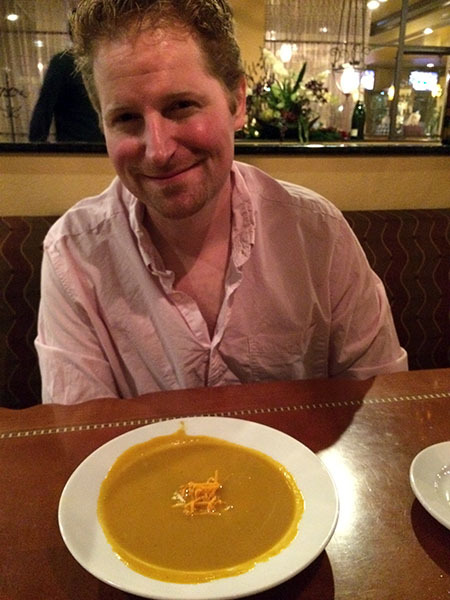 The butternut bisque was also a hit with almonds and a slight citrus tang and sweetness. 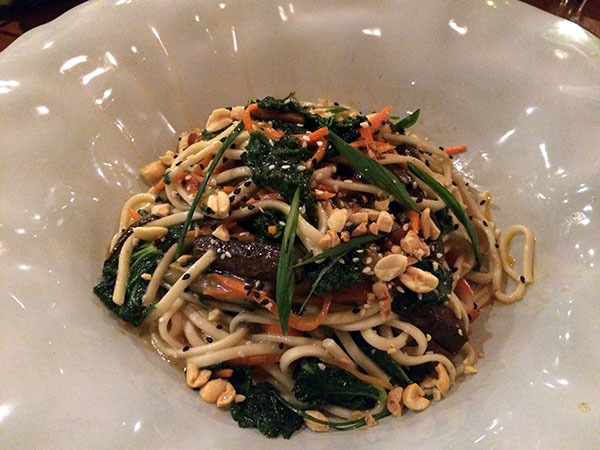 The udon noodle dish with kale, sesame seeds, eggplant, and peanuts was my favorite because the noodles were al dente, still slightly firm with a bite and nice texture. The grits with gravy, veggies, potatoes straws, and sunchokes was also a creative and tasty southern-themed dish with flare. I’m not a huge dessert person while eating out lately, but the menu came with it so we had to, right? :-) Luckily they were the perfect, dainty portions. 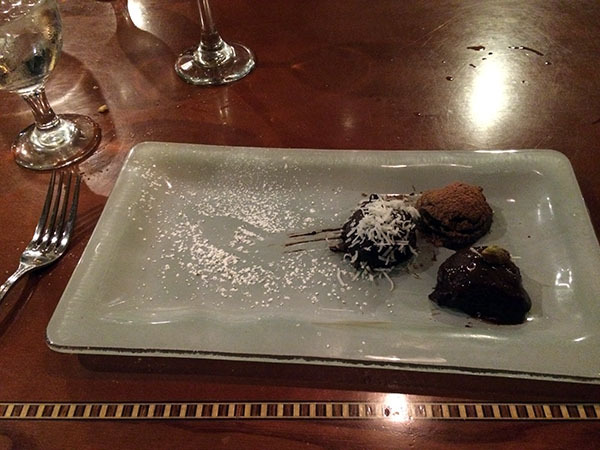 We started with the chocolate truffles which were good, but almost too sweet with the dark chocolate flavors. 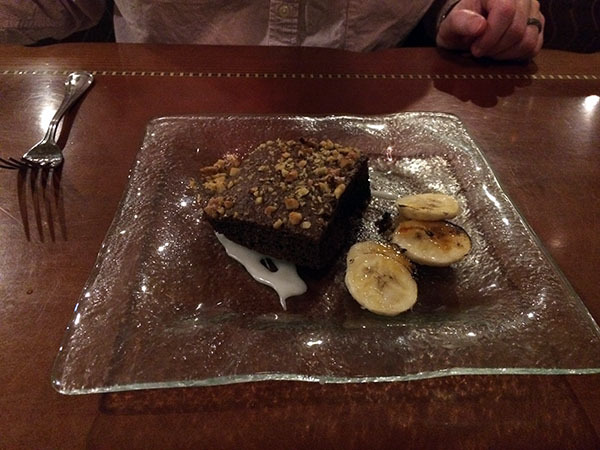 The banana cocoa walnut cake was better because it had a slight, spicy bite to it that was great with the slightly charred banana slices. Overall a great menu for the price and a wonderful evening with a gorgeous view of the bridge and water. Tower Bridge Bistro is serving a new vegan menu every weekend through Valentine’s Day and maybe longer which is very exciting! If you’re in the Sacramento area for the weekend, give them a try.